Mladá Boleslav / Frankfurt, 11 September 2017 – ŠKODA is continuing its campaign in the SUV segment. With the ŠKODA KODIAQ SCOUT, the brand presents a model, which exerts its off-road capabilities both visually and in terms of technology. With its new robust front and rear spoilers the ŠKODA KODIAQ SCOUT is 9 mm longer than the basic model and underlines its powerful character. The 19-inch alloy wheels in an anthracite colour for the ŠKODA KODIAQ SCOUT also contribute to its powerful appearance. There is a choice of two petrol and two diesel engines for the new model, each combined with the all-wheel drive. The ŠKODA KODIAQ SCOUT stands out with its distinct design features. 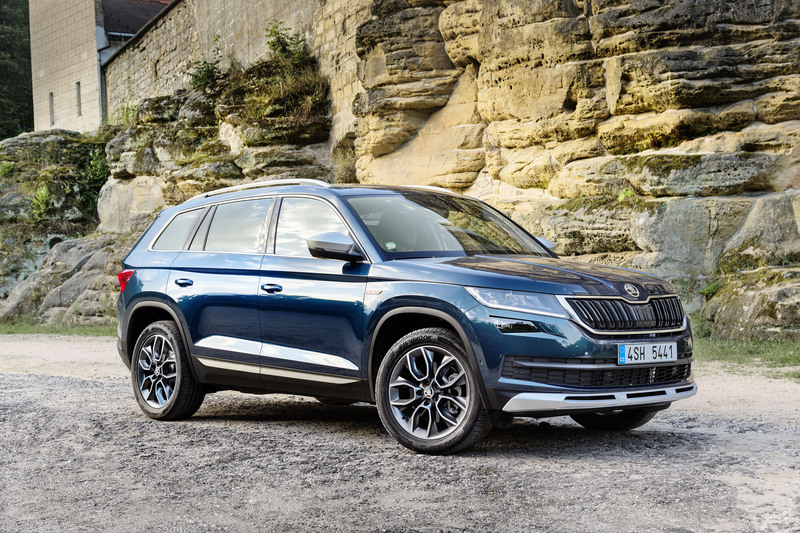 With a length of 4.706 mm, up to seven seats, and the largest interior and boot within its segment, the ŠKODA KODIAQ SCOUT impresses in numerous ways. It represents a successful mix of emotiveness, rationality and robustness with its modern design. The model variant’s originality is noticeable at first glance. The silver-coloured underbody protection, which is visually split into three parts, emphasises the off-road capability of the ŠKODA KODIAQ SCOUT. The roof rails, wing mirror housings and side window trims are also silver in colour. The tinted rear window and rear side windows (SunSet) are another distinguishing feature of the exterior. The ŠKODA KODIAQ SCOUT comes equipped with 19 inch alloy wheels in an anthracite colour as standard. Furthermore, it bears small badges with the model designation on the front wings and the glove compartment. The robust character of the ŠKODA KODIAQ SCOUT, which is based on the Ambition trim level, is also reflected in the features and interior. Functions that come as standard include Off-Road Assist, which adjusts the electronic chassis systems at the push of a button, a Rough-Road package with underbody and engine protection, front and rear Park Assist as well as Driving Mode Select (Eco, Normal, Sport, Individual and Snow), which can be used to control the engine, automatic transmission, power steering and air conditioning. Snow mode adapts the operation of the ABS, ASR and ACC (if fitted) systems, as well as the engine management to slippery and snow-covered roads. Special features in the interior also emphasise the distinctive character. The ŠKODA KODIAQ SCOUT comes as standard with Alcantara®-covered seats containing the SCOUT logo, a multifunction steering wheel, stainless steel pedals, LED ambient lighting which can be set to one of ten colours, the Swing infotainment system with eight loudspeakers, door trims in the Alcantara® design, front and rear door sills containing the KODIAQ logo. The centrepiece of the all-wheel-drive system, which comes as standard for all variants of the ŠKODA KODIAQ SCOUT, is an electronically controlled multi-plate clutch that is located directly in front of the differential, i.e. at the end of the propshaft, for optimal distribution of the load on the axles. The all-wheel-drive system works quickly and intelligently, its control unit constantly calculates the ideal driving torque for the rear axle. Loss of traction is virtually eliminated due to a control system that is dependent on driving status. In normal driving conditions, especially with a light load and when coasting, the multi-plate clutch transfers the engine power in a fuel-economical way mainly to the front wheels. The ŠKODA KODIAQ SCOUT also feels at home on off-road terrain. With a ground clearance of 194 mm, it can even negotiate larger bumps with ease. It has a ramp angle of 21.3 degrees; the approach and departure angles are an impressive 20.1 and 22.8 degrees respectively due to the short overhangs. In addition, the Rough-Road package, which comes as standard, protects against damage to the underbody, engine and gearbox, brake and fuel lines as well as cables. When the paved road ends, the driver can select Off-Road mode at the simple press of a button. The optional DCC shock absorbers then adjust their settings accordingly; throttle response is slightly reduced. The anti-lock braking system (ABS) permits a certain amount of slip so that a braking wedge can be formed in front of the wheels. To improve traction in Off-Road mode, the TCS permits a greater slip and the electronic differential lock (EDL) reacts sharper and faster. Hill-Hold Control and Hill-Descent Control are also activated when necessary – Hill-Descent Control helps the driver maintain a constant speed when negotiating a downhill slope. With their wide range of driver assistance systems, all of the ŠKODA KODIAQ variants set benchmarks within their segment. New functions include Trailer Assist, Blind Spot Detect, which warns of any vehicles in the blind spot, and Rear Traffic Alert, which monitors traffic coming from the sides and behind when manoeuvring etc. The Crew Protect Assist function, which closes windows and the sunroof in the event of an impending accident and tensions the seat belts of the front seats, works in conjunction with the improved Front Assist function, which includes the City Emergency Brake and predictive Pedestrian Protection functions. Park Assist, just as on the regular ŠKODA KODIAQ, has been further perfected. Also highly helpful is the Area-View system: the surround-view cameras, which are located in the front and rear sections as well as in the wing mirrors, come with wide-angle lenses and allow views of the area immediately surrounding the vehicle to be displayed on the monitor. These include a virtual top-down view and 180-degree images from the areas to the front and rear. This makes it easier to drive in confusing situations or on rough terrain. The ŠKODA KODIAQ SCOUT can be equipped with all modern infotainment systems. The capacitive touch displays feature a glass design (except for the standard Swing sound system). The top-of-the-range version, the Columbus navigation system, has a 9.2-inch monitor, a Wi-Fi hotspot and an LTE module (optional). In addition, the ŠKODA KODIAQ SCOUT features a screen specially displaying the steering wheel angle, the compass, the altimeter, and the oil and coolant temperature. The automatic Emergency Call function comes as standard. The mobile online services from ŠKODA Connect are the perfect addition for the state-of-the-art infotainment system. They set new benchmarks in terms of navigation, information, entertainment and assistance, and can even be configured using your home computer or via the ŠKODA Connect app.